Looking for a healthy way to satisfy a sweet tooth? 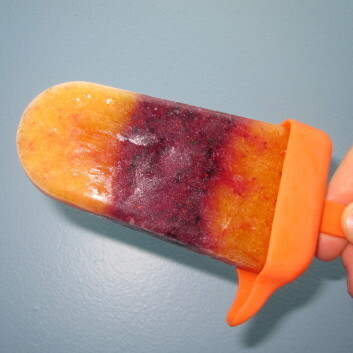 Try these super quick and easy blueberry-nectarine fruit pops made with 100% pure fruit. The vibrantly colored layers make these pops extra fun! To a blender or food processor, add the nectarines, 1 teaspoon lemon zest, 1 tablespoon lemon juice, and up to 1 teaspoon sugar or honey (if the fruit is very ripe and sweet, you do not need to add sugar). Blend the nectarines until smooth and transfer the puree to a storage container. Store the puree in the refrigerator until ready to use. Rinse the blender or food processor. Add the blueberries, remaining 1 teaspoon lemon zest, remaining 1 tablespoon lemon juice, and up to 1 teaspoon sugar or honey (if the fruit is very ripe and sweet, you do not need to add sugar). Blend the blueberries until smooth and transfer the puree to a storage container. Store the puree in the refrigerator until ready to use. To make the first layer, pour the nectarine puree into 4 ice pop molds, filling each mold about a third of the way to the top. Freeze for 20 minutes to set. To make the middle layer, pour the blueberry puree into the pop molds, filling each mold about two thirds of the way to the top. Freeze for 20 minutes to set. Finally, pour in more of the nectarine puree, filling each mold nearly to the top. Freeze the pops for at least 3 hours, or until frozen solid.